A cognitive radio system needs accurate knowledge of the radio spectrum it operates in. Blind modulation recognition techniques have been proposed to discriminate between single-carrier and multicarrier modulations and to estimate their parameters. Some powerful techniques use autocorrelation- and cyclic autocorrelation-based features of the transmitted signal applying to OFDM signals using a Cyclic Prefix time guard interval (CP-OFDM). In this paper, we propose a blind parameter estimation technique based on a power autocorrelation feature applying to OFDM signals using a Zero Padding time guard interval (ZP-OFDM) which in particular excludes the use of the autocorrelation- and cyclic autocorrelation-based techniques. The proposed technique leads to an efficient estimation of the symbol duration and zero padding duration in frequency selective channels, and is insensitive to receiver phase and frequency offsets. Simulation results are given for WiMAX and WiMedia signals using realistic Stanford University Interim (SUI) and Ultra-Wideband (UWB) IEEE 802.15.4a channel models, respectively. Spectral monitoring has received considerable attention in the context of opportunistic and cognitive radio systems. Blind modulation recognition (with no a priori information) consists in identifying the different signal components (air interfaces) that are present in an observed spectrum. A survey of algorithms currently available in literature can be found in . While past studies have focused on single-carrier modulations, research has recently also focused on the identification of multicarrier modulations. On one hand, mixed moments  and fourth-order cumulants [3, 4] can be used to discriminate between single-carrier and multicarrier modulations and to estimate their parameters. For instance, the fourth-order cumulants of OFDM signals converge to 0 as the number of subcarriers increases independently of the Signal-to-Noise Ratio (SNR) and hence can be used to distinguish between single-carrier modulations and multicarrier modulations propagating through an Additive White Gaussian Noise (AWGN) channel. Unfortunately, mixed moments and fourth-order cumulants do not perform well for more realistic channels, that is, frequency selective channels with time and frequency offsets. On the other hand, cyclic autocorrelation-based features [5–7] have been proposed to discriminate between single-carrier and multicarrier modulations in time dispersive channels and affected by AWGN, carrier phase, and time and frequency offsets. Moreover, a number of procedures [8–11] have been proposed using autocorrelation- and cyclic autocorrelation-based features to extract parameters for OFDM signals using a Cyclic Prefix time guard interval (CP-OFDM) and propagating through a frequency selective channel. In this paper, we review the existing techniques presented in [5–12] using autocorrelation- and cyclic autocorrelation-based features for CP-OFDM signals in frequency selective channels to determine the power, oversampling factor, useful time interval, cyclic prefix duration, number of subcarriers, and time and frequency offsets. The carrier frequency of the signal of interest is first estimated by an energy detector in the spectral domain followed by a downconversion to baseband for further analysis. Then, we propose a blind parameter estimation technique based on a power autocorrelation feature which can be operated in frequency selective channels and applied to OFDM signals using a Zero Padding time guard interval (ZP-OFDM). The zero padding, in particular, excludes the use of the autocorrelation- and cyclic autocorrelation-based techniques. The proposed technique leads to an efficient estimation of the symbol duration and zero padding duration, and it is insensitive to phase and frequency offsets. In Section 2, we review the blind parameter estimation using features based on autocorrelation and cyclic autocorrelation for CP-OFDM signals. In Section 3, we present the blind parameter estimation using a new feature based on power autocorrelation for ZP-OFDM signals. Simulation results are given in Section 4 for WiMAX and WiMedia signals using realistic Stanford University Interim (SUI) and Ultra Wide-Band (UWB) IEEE 802.15.4a channel models respectively [13, 14]. In this section, we review different algorithms used for the estimation of the carrier frequency, power, and oversampling factor of an observed signal component. Then the features based on autocorrelation and cyclic autocorrelation are presented for CP-OFDM signals to estimate the useful time interval, cyclic prefix duration, and the number of subcarriers in frequency selective channels. where is the vector of transmitted symbols, which have been oversampled by a factor , the 's are the multipath channel coefficients with the number of channel taps, is the vector of Additive White Gaussian Noise (AWGN), is the receiver phase offset, and is the receiver frequency offset. 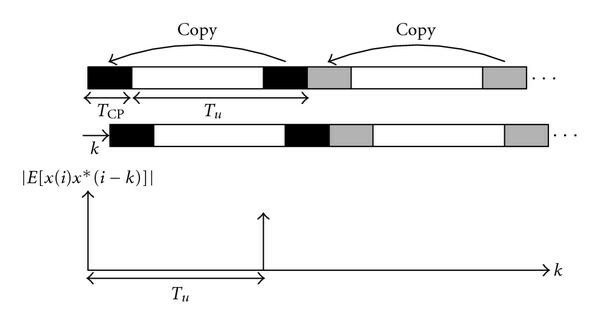 Figure 1 shows an example of a received sequence of 4096 samples from a real CP-OFDM data measurement (with 26 tones going through an unknown channel and sampled at the receiver with a known sampling rate) after carrier estimation, downconversion, and lowpass filtering. The estimation of the oversampling factor and signal power is performed using the algorithm presented in this section, leading to and for this particular data measurement. Estimation of the oversampling factor and power spectral density using real world measurement data. with the shift index. One can assume that the autocorrelation function is cyclically shifted; that is, two vectors are concatenated in order to cope with the data outside the interval . For CP-OFDM, the last part of the OFDM symbol is copied at the beginning to prevent Inter Symbol Interference (ISI) after multipath propagation. Therefore, a peak in the autocorrelation function can be observed at delay . 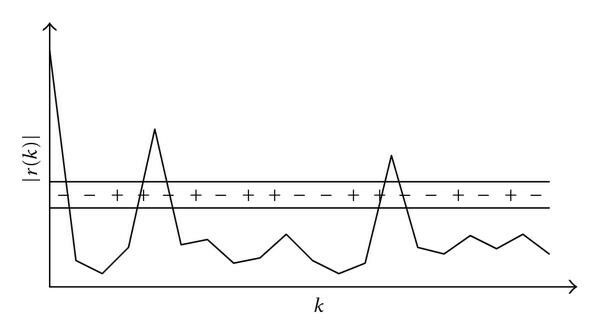 Figure 2 shows the ideal autocorrelation function for a transmitted CP-OFDM signal . Correlation on a CP-OFDM signal. with the variance of the transmitted signal and the variance of the AWGN. As stated by these equations, there are peaks due to the multipath coefficients when the channel is stationary over the observation window. Therefore, one can use a peak detection algorithm similar to  based on positive and negative slopes ("+−" corresponding to the event of a positive slope followed by a negative slope on Figure 3). One can assume that the maximum channel delay spread is smaller than the useful time interval , and therefore the peaks corresponding to the cyclic prefix insertion will appear as a second cluster of peaks at higher values of . Hence one can discard the peaks with the lowest shifts and keep the peaks with the highest shifts for the estimation of the useful time interval. Peak detection algorithm based on positive and negative slopes. corresponding to the search for the optimal index for which the difference between a peak (when a +− occurs) and its lowest previous point (its previous −+) is maximized. The choice of the modulus leads to an insensitivity of the autocorrelation feature to phase and frequency offsets (as the exponentials factors in (10) disappear). Finally, time and frequency offsets can be determined using cyclostationarity properties of CP-OFDM signals with prior information on the pulse shaping filter  or conventional autocorrelation methods without prior knowledge on the pulse shaping filter . with the shift index and where is defined in (3). By autocorrelating the power of the transmitted sequence, we can observe a train of triangles with period as shown in Figure 4. Power autocorrelation on a ZP-OFDM signal. Power autocorrelation of a ZP-OFDM signal on a CM-4 channel model with dB. Simulation results are performed on the Stanford University Interim (SUI) channel models  for WiMAX signals  and Ultra-Wideband (UWB) IEEE 802.15.4a Channels Models (CM)  for WiMedia signals . Two types of channels are chosen, on one hand the SUI-1 and the CM-1 channel models which have a Line-of-Sight (LOS) property for flat terrain with light tree density and, on the other hand, the SUI-4 and the CM-4 channel models which have a Non-LOS property for hilly terrain with heavy tree density. The different characteristics of SUI channels models are given in Table 1. For the CM channel models we refer to . The parameters used for the WiMAX (CP-OFDM) and the WiMedia (ZP-OFDM) transmitters are given in Table 2. When using these channel models to evaluate existing modulation recognition procedures discriminating between single-carrier and multicarrier modulations based on mixed moments and fourth order cumulants [2–4], it is observed that the threshold values for the different features can vary greatly with the different channel models. Therefore, these algorithms are not suitable for the detection of an OFDM signal without a priori knowledge of the channel conditions. The detection algorithms presented in this paper, however, are not based on the search for a threshold in a particular scenario, but rather on jointly detecting/estimating OFDM parameters blindly as in [5–7, 9–11]. Figure 6 shows the autocorrelation peaks observed for a received sequence of 10 CP-OFDM symbols (WiMAX parameters) with an SNR of 0 dB, a frequency offset , and a phase offset on an SUI-4 channel model. As seen in [6, 7], the modulus of the autocorrelation feature is insensitive to phase and frequency offsets. We can see autocorrelation peaks at delay 0 and for short delays up to the maximum delay spread of the multipath channel. Then we can observe a significant peak corresponding to the useful time interval microseconds (corresponding to a value 256 on the -axis of the figure having normalized the sampling period of the lowpass filter to unity). 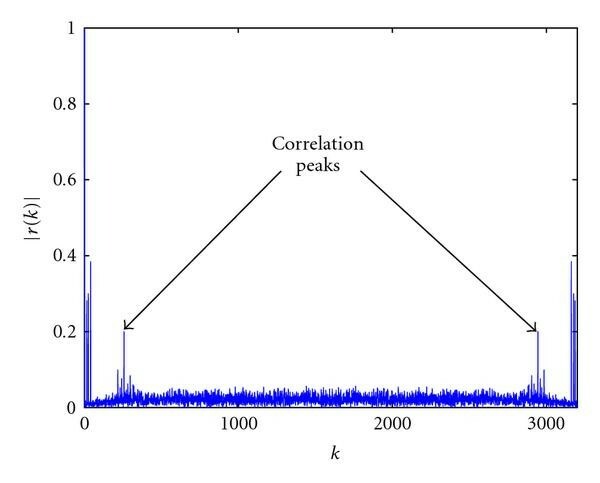 In this figure, two significant peaks can be observed owing to a cyclic shifting used in the autocorrelation operation. Autocorrelation of a CP-OFDM signal through SUI-4 channel model with AWGN at dB. 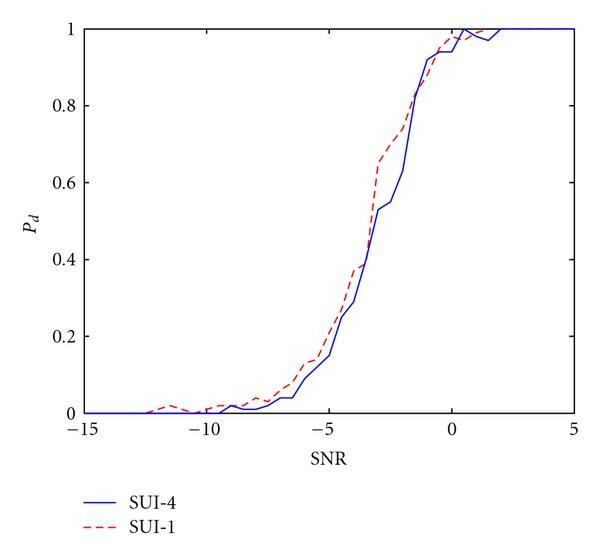 Figure 7 shows the performance of the algorithm in terms of probability of correct detection (which indicates that the algorithm correctly estimates the useful time interval and the CP duration ) versus SNR (WiMAX parameters) on SUI-1 4 channel models. From this figure, we can conclude that at 5 dB we are sure to correctly estimate the useful time interval and the CP duration of a CP-OFDM signal using a record of 10 OFDM symbols on generic SUI channel models. Moreover, the algorithm is rather insensitive to the channel (as good for SUI-4 as for SUI-1). 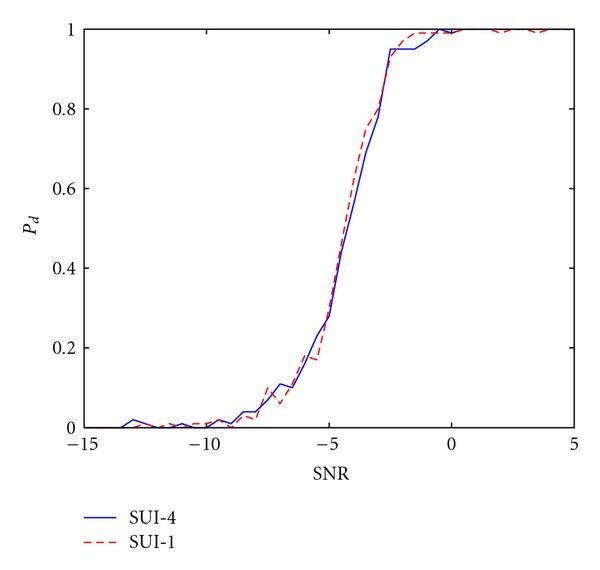 Probability of detection of a CP-OFDM signal through SUI-1 4 channels models with AWGN. The coefficient variation shows that the algorithms give a good estimate of the useful time interval and the CP duration at a particular SNR threshold. On SUI-1 channel, the useful time interval is well estimated at dB, while its CP duration is well estimated at dB. On SUI-4 channel, the useful time interval is well estimated at dB, while its CP duration is well estimated at dB. CV(RMSD) of the useful time interval and the CP duration on SUI-1 4 channel models with AWGN. This characteristic can also be used for the detection of CP-OFDM signals. As the noise and the transmitted sequence are random variables which are independent and identically distributed (i.i.d), the autocorrelation function of the received sequence is 0 for . Moreover, the probability of false alarm for noise and single carrier modulations is related to the length of the window used for estimation . In our simulations, we use a received sequence (which is referred as a "block") of 3200 samples (equivalent to the number of samples for 10 CP-OFDM WiMAX symbols) and a maximum number of channel taps , giving a probability of false alarm . Consecutive blocks for noise and single carrier modulations will have a very high probability to give different estimates, while CP-OFDM signals will provide the same estimate with a very high probability. Therefore, if two consecutive blocks provide the same estimate of the useful time interval or the CP duration , we declare that a CP-OFDM signal is detected. If the consecutive blocks provide different estimates of the useful time interval or the CP duration , then the signal is declared either noise or single carrier modulation. Table 3 shows the actual performance using a set of measured data similar to Figure 1 where the signal has already been downconverted to baseband. The data sets GW16-GW26 are CP-OFDM signals from 16 to 26 tones going through unknown channels and sampled at the receiver. The sampling period of the lowpass filter is normalized to unity. This table shows that we can obtain a good approximation on the estimate of the number of subcarriers using real data measurements. Estimated parameters for CP-OFDM signals using real data measurements. Figure 9 shows the shifted power autocorrelation variations for a received sequence of 10 ZP-OFDM symbols (WiMedia parameters) with an SNR of 0 dB and the target filter used for the estimation of the zero padding duration given in (21) with a frequency offset and a phase offset on a CM-4 channel model. As seen in Section 3, the power autocorrelation feature is insensitive to phase and frequency offsets. We can see that the succession of triangular functions can be well approximated by the target filter. However, the noise has a negative impact on the estimation of the zero padding duration, and therefore a significant SNR is necessary to have an accurate estimation of the zero padding duration (cf. Figure 5 with dB). 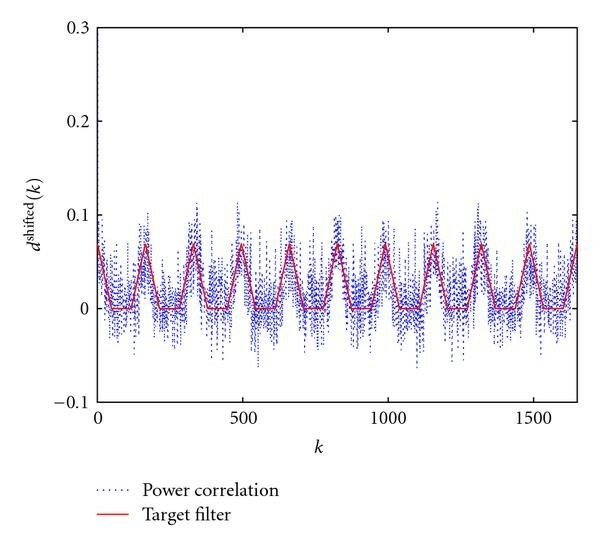 Power autocorrelation of a ZP-OFDM signal and its estimated target filter through CM-4 channel models with AWGN at dB. 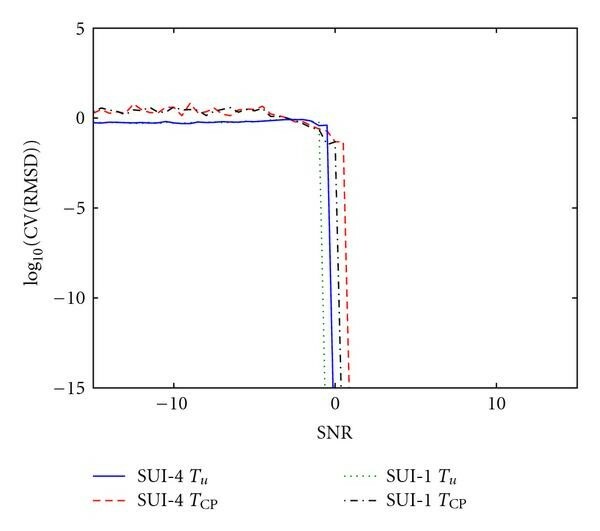 Figure 10 shows the performance of the power autocorrelation to estimate the symbol duration for different values of the SNR (WiMedia parameters) on CM-1 4 channel models. The algorithm shows very good performance even at low SNR for 10 received ZP-OFDM symbols on generic Ultra-Wideband (UWB) IEEE 802.15.4a channel models, with very high probability of correct detection (which indicates that the algorithm correctly estimates the symbol duration ) at dB. Moreover, if we use the power autocorrelation technique with 10 ZP-OFDM symbols and WiMAX parameters on SUI-1 4 channel models, we get a high probability of correct detection at dB as seen on Figure 11, owing to the larger number of subcarriers (or useful time interval microseconds) and zero padding duration microseconds compared to the WiMedia parameters. 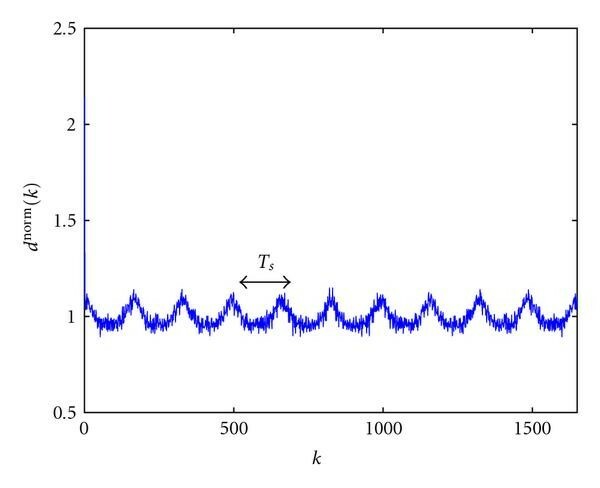 It can be shown by simulation that the key parameters are the number of subcarriers (or useful time interval ), zero padding duration , and number of OFDM symbols (the algorithm is rather insensitive to the channel). In fact, the greater these key parameters, the lower the SNR necessary to achieve a perfect symbol duration detection. 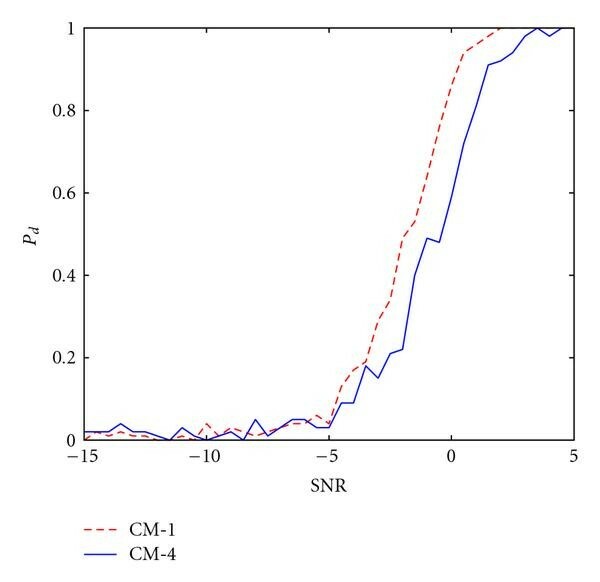 Probability of detection of a ZP-OFDM signal through CM-1 4 channel models with AWGN. 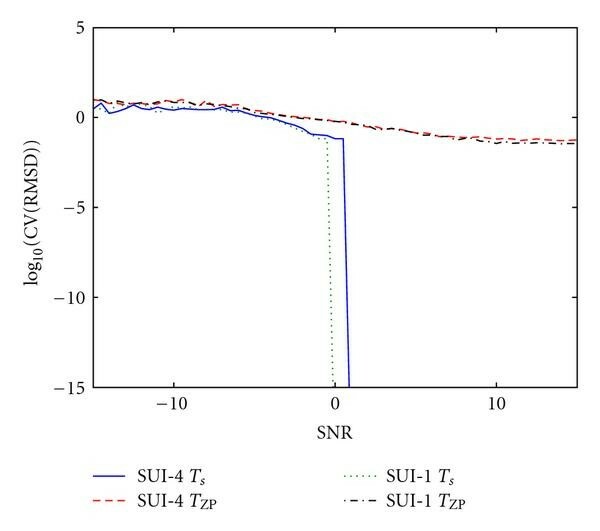 Probability of detection of a ZP-OFDM signal SUI-1 4 channel models with AWGN. Figure 12 shows the CV(RMSD) for the symbol duration and the ZP duration on SUI-1 4 channel models. The CV(RMSD) shows that the algorithms give a good estimate of the symbol duration at a low SNR threshold. On SUI-1 channel, the symbol duration is well estimated at dB, while on SUI-4 channel, the symbol duration is well estimated at dB. As the zero padding duration is more sensitive to noise, the CV(RMSD) for reduces as the SNR increases. If we have to consider a feature for the detection of ZP-OFDM signals, the choice of is more appropriate. Indeed, as the noise and the transmitted sequence are random variables which are independent and identically distributed (i.i.d), the shifted power autocorrelation function (25) of the received sequence is 0. 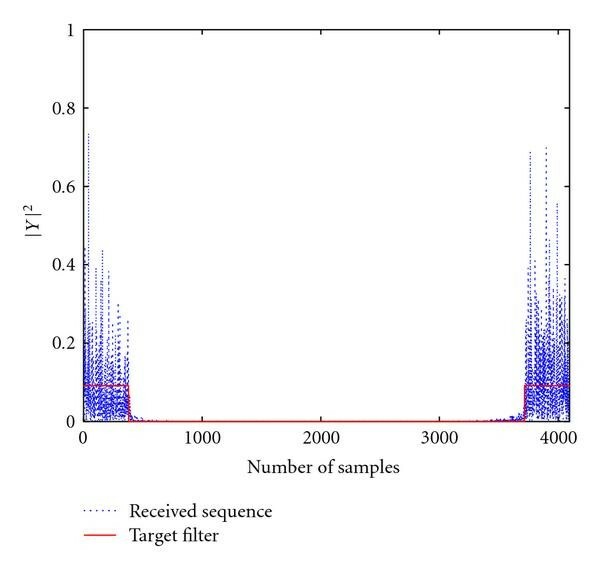 Moreover, the probability of false alarm for noise and single carrier modulations is related to block size of the received sequence used for estimation . In our simulations, we use a block of 1650 samples for WiMedia parameters and a block of 3200 samples for WiMAX parameters (equivalent to the number of samples for 10 ZP-OFDM symbols), giving a probability of false alarm and , respectively. Consecutive blocks for noise and single carrier modulations will have a very high probability to give different estimates, while ZP-OFDM signals will provide the same estimate with a very high probability. 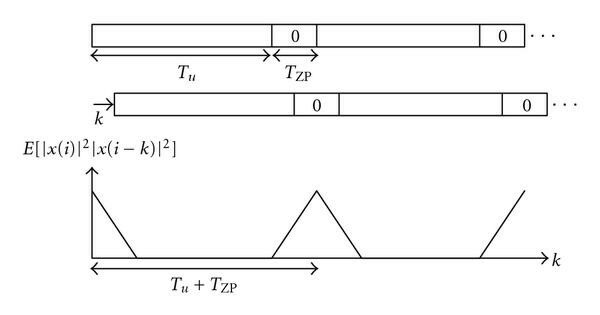 Therefore, if two consecutive blocks provide the same estimate of the symbol duration , we declare that a ZP-OFDM signal is detected. If the consecutive blocks provide different estimate of the symbol duration , then the signal is declared either noise or single carrier transmission. CV(RMSD) of the symbol duration and the ZP duration on SUI-1 4 channel models with AWGN. In this paper, we have proposed a blind parameter estimation technique based on a power autocorrelation feature applying to OFDM signals using a Zero Padding time guard interval (ZP-OFDM) which in particular excludes the use of the autocorrelation- and cyclic autocorrelation-based techniques. The proposed technique has led to an efficient estimation of the symbol duration and zero padding duration in frequency selective channels and was insensitive to receiver phase and frequency offsets. Simulation results were given for WiMAX and WiMedia signals using realistic Stanford University Interim (SUI) and Ultra-Wideband (UWB) IEEE 802.15.4a channel models, respectively. Simulation results have shown that OFDM signals without a CP (as used in WiMedia) could be detected based on their zero padding without any loss in performance compared to similar CP-OFDM parameter estimation algorithms. These techniques could be used in several applications to monitor ZP-OFDM signals and to estimate their parameters (Bluetooth 3.0, WiMedia, etc.). This research work was carried out in the frame of the European FP7 UCELLS project. The scientific responsibility is assumed by its authors.